I don’t know about you, but I love to have visitors, especially if they are congenial and well behaved. For the past several weeks just such a visitor has been showing up at my bird feeder. I am talking about the common redpoll which my Audubon Handbook of Eastern Birds identifies as Carduelis flammea. The common redpoll can be found on Plate 375 of Audubon’s Birds of America as Acanthis Linaria. I am always happy to see them. The redpoll is a bird of the far northland where it breeds and raises its young on the tundra and in northern forests. During the winter these birds will come south to over-winter in places like New Brunswick. I often think that if this is where they come to spend the winter imagine how brutal the weather must be where they normally live! They do not come and visit every winter and a number of years can pass before you see them again. I look for them eagerly and always count a winter when they return as a special one. The redpoll is a gregarious and very gentle bird. Its distinguishing feature is a bright red patch on the top of its head. 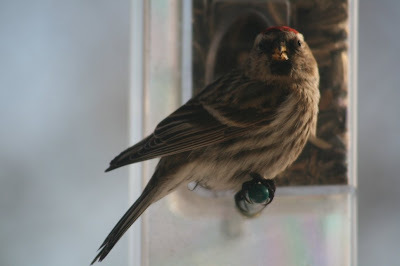 It is as if the redpoll had been held upside down and dipped into a can of red barn paint. It is a very handsome little finch and usually quite tame. If you stand quite still you can get very close to them while they are feeding. The other day, after one of them had finished eating, he sat very contentedly for the longest time surveying the world about him. I felt very fortunate to have such a long view of him as well. Soon the redpolls will leave us and return north to think about raising their families for another year. They never really announce their departure and it is not something that you immediately notice. It just gradually dawns on you that you aren’t seeing them around anymore. Whether they return next winter we shall have to wait and see. On another note, one of the reasons that I started this blog was to inspire young people to become interested in the environment around them. I spend some of my time mentoring a group of tweenagers and I am genuinely impressed with the level of interest and concern that they have for the planet. I encourage this as much as I can. I have discovered the website of one such young person that I should like to suggest to you. Her name is Helena and her blog is called Adventures of Bird Girl. For a fresh perspective on the world around you I highly recommend that you visit her website. To quote Helena directly, “I love nature and wildlife more than anything in the world.” She is definitely a person after my own heart. March 26, 2008 at 7:57 p.m.
Well, I'm no longer young, but consider me encouraged! March 27, 2008 at 7:02 a.m. This is a Flickr badge showing photos in a set called Portfolio 1. Make your own badge here.